President Donald Trump delivers his first address to a joint session of the U.S. Congress on Feb.28, 2017 in the House chamber of the U.S. Capitol in Washington, DC. President Donald Trump's vision for America may include landing astronauts on the moon or Mars by the mid-2020s, if his first address to a joint session of Congress is any guide. 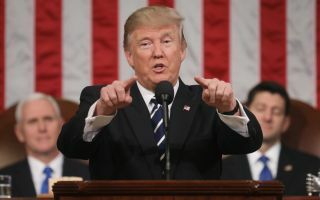 "American footprints on distant worlds are not too big a dream," the president said during his Tuesday night (Feb. 28) speech. President Trump gave no details about which celestial destination he favors for American astronauts; the "footprints" sentence was the only discussion of space exploration in his hour-long speech. The president gave space exploration a similarly fleeting mention in his Jan. 20 inaugural address, in which he said that America stands "ready to unlock the mysteries of space." No American has ventured to deep space since the last Apollo moon mission returned to Earth in late 1972. And the nation has lacked the ability to launch its own astronauts since July 2011, when the space shuttle program came to a close. But this situation may change soon. Two American companies, SpaceX and Boeing, are developing spacecraft to take astronauts to and from the International Space Station under multibillion-dollar NASA contracts; both private vehicles should be ready by 2018 or 2019, agency officials have said. And NASA is currently working to get astronauts to Mars by the mid-2030s, as directed by former President Barack Obama in 2010. The space agency is building a giant rocket called the Space Launch System (SLS) and the Orion capsule to make this happen. Orion and SLS are currently scheduled to fly together for the first time in late 2018, on an uncrewed journey around the moon known as Exploration Mission 1 (EM-1). But NASA is considering putting astronauts on EM-1 — a move that would likely push the launch into 2019, experts have said. Even if EM-1 does launch with astronauts aboard, SpaceX may beat NASA to the lunar punch. The company plans to launch two paying customers on a private trip around the moon toward the end of 2018, SpaceX founder and CEO Elon Musk announced Monday (Feb. 27). The mission will use SpaceX's Dragon capsule and its Falcon Heavy rocket, which is scheduled to launch for the first time this year. SpaceX also aims to help colonize Mars. In September 2016, Musk unveiled the company's planned Interplanetary Transport System (ITS), a rocket-spaceship combo that the billionaire entrepreneur said will launch thousands of people to the Red Planet. The first ITS flights could come as early as the mid-2020s if everything goes well, Musk has said.